Take your essentials with you when you’re on the move. 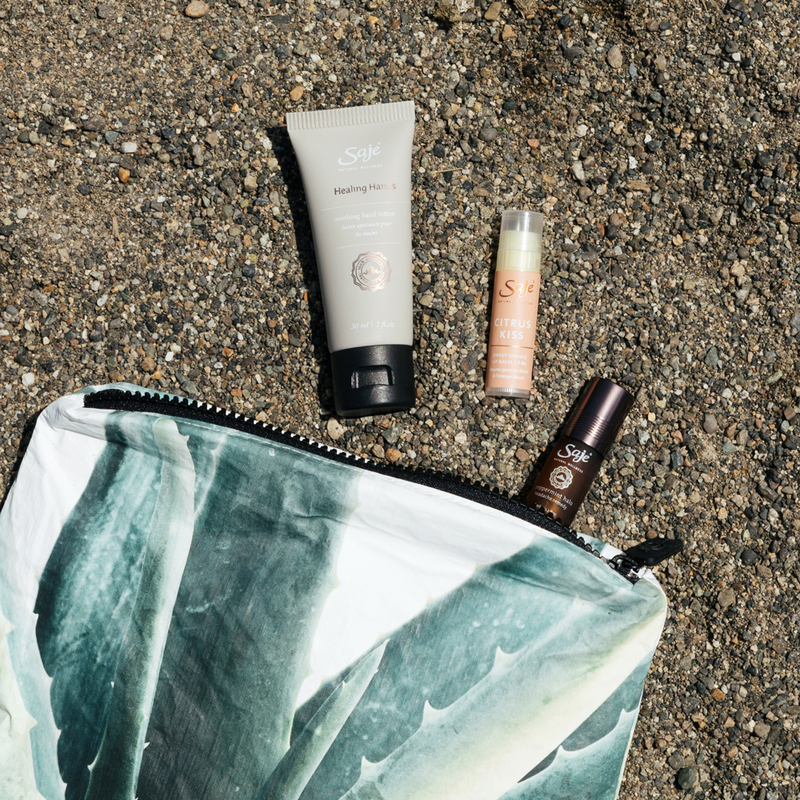 Keep a cool head, soothe your hands and soften your lips with these plant-based blends curated in a limited edition splash-proof bag designed by ALOHA Collection. Includes Peppermint Halo® Oil Blend (0.2 fl oz | 6 ml), Healing Hands Lotion (1 fl oz | 30 ml) and Citrus Kiss Lip Balm (0.16 oz | 1.5 g). Apply lip balm as often as desired to moisturize and nourish dry lips. For external use only. Keep out of reach of children. Keeping you feeling well and energized, wherever your travels take you. A limited edition splash-proof bag in collaboration with ALOHA Collection. I love the bag and I use it to transfer my beauty products from my purse to my diaper bag. It's just the right size and soft enough to fit in smaller spaces. The lotion and the peppermint halo were smaller, more like a travel size, which worked well for me, as it stayed in the bag for my purse/diaper bag. I would love more bags made out of this fabric and.would love it if Saje worked with them again. Brought this bag on my last beach destination. Worked wonderfully on the beach. Kept all my essentials dry and clean! The Saje products inside are a bonus :) Saje...please collaborate with Aloha bags again. This set is very highly priced which I found out later is mainly because of the reusable bag! The products inside are the small version (and the hand cream felt like the container was empty). The bag will be useful though and is of good quality. I bought this kit for the bag, such a pretty design and super lightweight which is great for traveling. This kit comes with pep halo, lip balm and hand lotion making it a good gift for those who are new to Saje products since it gives you a bit of everything. I would definitely love to see more collaborations with the Aloha brand in the future.